Connecting the dots to reveal hidden patterns and possibilities in our world. This week's PBS Frontline show was fascinating. They discussed the financial meltdown and how it was exacerbated by the massive intra-connectivity of the banking system. Frontline focused on the trade-offs between "moral hazard" -- punishing the bad guys for bad behavior, and "systemic risk" -- allowing the bad guys to fail and effect the rest of the interconnected system. The main contagion under discussion were the investments created by Bear Stearns, Lehman Brothers -- packaging up sub-prime and other mortgages into mortgage-backed securities which were then sold to other banks and investors. Using social network analysis, let's take a look at how a contagion spreads through a connected system. Below, is a small-world network that models what the interconnected banking ecosystem may look like. The red nodes represent banks, while the grey links represent who may be doing business with whom. The arrows represent the flow of assets [who pays whom]. We will look at three nodes/banks and the effect they have on the rest of the system. The nodes/banks are labeled: A, B, and C. We chose to examine these nodes because they are in different parts of the network. A is in the thick of things, in the dense center cluster. B is on the periphery of that dense cluster, and C is very lightly connected node at the very edge of the system. First we look at the best connected node, A -- deep in the dense part of the network. Suppose Bank A is selling toxic assets it has packaged as investments. We ask our social network analysis software to show the immediate connections of node A -- it's direct business partners -- those who are buying the toxic assets. The nodes that show up in yellow, with the red border, below are one step away from the bank selling toxic assets -- they do business directly with the infected bank. 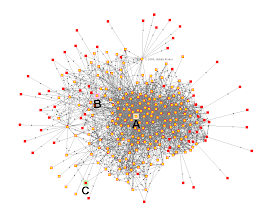 We now see that a portion of the banking network is infected -- yellow nodes are infected, solid red nodes are not. Next we move out two steps from the infectious bank -- the yellow nodes now show both the direct and indirect business partners of the infected bank -- we notice how quickly the contagion spreads as the mortgage-backed securities are packaged and re-packaged and sold and re-sold. Now we have more yellow/infected nodes than red/non-infected nodes -- the system has tipped. Now we move out three steps -- 3 degrees of separation -- from the infectious bank. We see that just about the whole ecosystem is now infected with some level of toxic assets. With all of re-packaging and re-selling of the securities no one really knows how much everyone is infected, but every yellow node is infected to some degree. As we expected, the well connected node in the thick of things spread the toxicity quickly to the rest of the system. Do the other nodes also have the ability to poison the well from where they sit? Next, we look at the bank on the periphery of the dense cluster -- node B, on the left side of the network. How fast will it's contagion spread? At one step, the spread is mostly local. At two steps there is an quick distribution of the contagion, including our original highly connected node in the dense middle. Once the highly connected node is infected we know the rest of the story from above. At three steps away from B a majority of the network is infected. We see that a bank on the periphery can also be devastating to any system it is embedded in. Finally we look at the bank that is barely connected to the system, node C. What effect will it have if it sells toxic assets into the inter-bank network? The initial transactions only infect a few nodes that are also on the edges of the network. At two steps, the contagion has touched the dense central cluster. At three steps from Bank C, a majority of the network is infected by the toxic asset. The "outsider" was able to infect the rest of the network -- it happened more slowly, but as investments were re-packaged and deals were made the contagion moved forward. There is good news and bad news about slow-moving contagions. The good news is they can be spotted and stopped before they do too much damage. The bad news is they are often ignored early on, because they have not done enough damage to pop up on anyone's radar -- so they spread stealthily. The key decisions the prior administration needed to make was to decide whether to follow the moral hazard argument or the systemic risk argument. With Bear Stearns they chose systemic risk -- they felt Bear Stearns was too connected to allow to fail. With Lehman Brothers they chose moral hazard -- they did not think Lehman was connected enough to cause systemic risk. They were wrong. As we saw above, a densely connected system is very vulnerable to any node feeding contagions into it. Bottom line: In a dense network, it does not matter where the problem starts, the whole system soon implodes -- there are just too many redundant paths for infection to travel. The meme should not be "too big to fail", but "too connected to fail"! I enjoyed this post, Valdis. It would be interesting to extend your analysis of the banking network to include of flows of assets (rather than merely connectivity). One could model the toxic assets as demand sinks that pulled good assets from other nodes. Then the quantity of the toxic assets and each bank's exposure to those assets becomes critical. Modeling the good assets as the positive source values at nodes would show when a bank would run out of assets, become "toxic" itself, and thus need to pull assets from other banks. Further, one could then add assets to nodes (i.e. the Fed's injection of capital to banks) to see the effects. Very interesting and intellectually accessible. Thank you. Although I certainly appreciate the exercice, I'd love a comparison between reputation mecanism, where doubt spreads like you describe, actual financial relations where the size and nature of the investment matters (and might be less alarming, thanks to dilution at the third degree) and — and this is far more the problem, I assume — *leveraged* relations, where asset in another bank is somewhat as safe as in-house cash, although that other bank only holds 8% of it, turning Basel II regulation into incestual masks. I guess what would come out of that is far more restrictive banking ratios, and the need for more public and detailed solvency statements. Like Bertil and Tee, i'd like to see some more information here. Not all of the nodes were of the same size. So while bank 'C' may have slowly infected the community, the amount of 'bad paper' they injected into the system was probably negligible. The 'problem' was that Countrywide was such a prolific writer of mortgages, not just its centrality. Also, another way of looking at why they let Lehman brothers go under was because they were an investment bank, not a commercial bank. I.E. its investors were there because of the risk, not the safety. You could also say that the person that let them go under (Paulson) was also former head of a rival company (Goldman Sachs). All-in-all, great post on the spread of a contagion. Now the question is how do we spread a beneficial contagion back through the network? Anyone have any retro-active vaccines? Byron makes some very good points about the relationships of key players involved in the subprime mortgage crisis "clean-up"(i.e., Paulson's relationship to Goldman Sachs, a rival of Lehman Brothers, and how these relationships may have influenced decisions). It would be interesting to map the social and organizational networks of the key players leading up to the collapse (e.g., Bernake, Blankfein, Cuomo, Dodd, Franks, Fuld, Greenspan, Mozilo, O'Neal, Paulson, Prince, Raines, Rubin, etc.). It would also be interesting to map out the networks of Madoff and Stanford. Thanks, Valdis. Your work above totally reinforces the term I have been hearing lately: "Zombie Banks". Can we now identify the walking dead? What might be some indicators to look for? I just found your blog and linked it to mine, www.beyondrealtime.com. Terrific content. Have learned a lot and I enjoyed your post on the banks so much I posted a comment about your take on BRT. Contagion is not solely limited by the interconnectedness of banking activities, but it is also the fear that is contagious among banking clients after a failure of a given institution. Its worse than you think! I think we agree ... anywhere the contagion starts, at almost any level of intensity, will result in easy spreading in a massively connected system. The shorter and redundant the paths, between many nodes, the quicker the spread. We are absolutely in agreement. Thx.